And also a game where you shoot a massive snake with a magic bow while riding a Unicamel, depending on the choices you’ve made. What really impresses me about it is the way the game resonates. 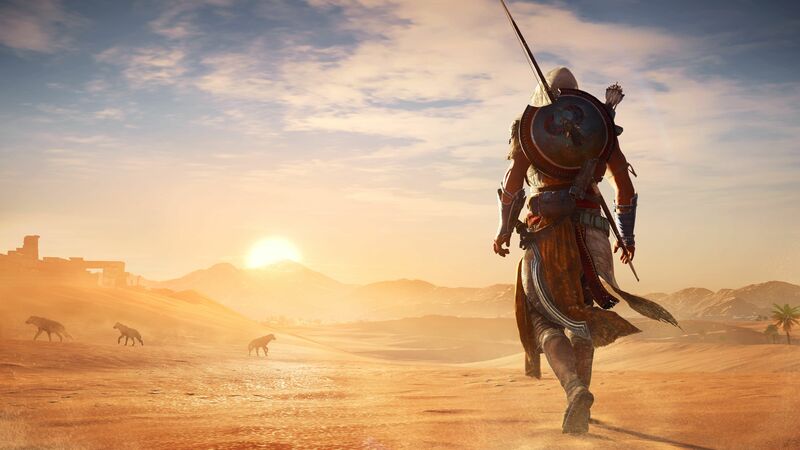 Bayek and Aya are, as the game opens, grieving the murder of their son in the best way they know; killing everyone responsible for it. There’s some great (And spoilery) writing out there about how their relationship evolves over the course of the game and how it maps onto their grief but the thing I keep coming back to is the sidequests. I am a sidequest fiend. If you give me a ‘This exclamation mark means you can do something here!’ sign then I will run towards it. The AC games have always either been too obsessed with this stuff or not enough but for me, Origins gets the mix perfectly. You can absolutely power through the plot in about 35-40 hours of gameplay. But if you put in that kind of time on the side quests too then you get a far more rewarding experience and a far more educational one for writers. Because Origins is a game that balances it’s deep fondness for violence with a total refusal to let its main character forget what’s driving that violence or the consequences of it. Bayek and Aya’s rampage would be the sole force in a lesser game. Here their son is Banquo, constantly present especially when he isn’t. Bayek’s tremendous care and respect when talking to children, the amount of satisfaction he gets from helping them, the fact it’s never enough. All of it leads to a heartbreaking, broken conversation at the end of the first piece of DLC where it’s clear that both he, and Aya, know just how much they’ve sacrificed for how little they’ve gained. That thematic purity is how every open world game should be done and honestly how I expect most to start being done from here on out. It’s like Mass Effect Andromeda‘s constant reminders of the shadow of the main character’s father, the pressures of command and just how young everyone is. Subtle, affecting writing that links character and plot and drives both forwards. That’s what I aim for with my RPG work and, on the good days, I get pretty close. Here’s my published work so far. If you want to talk to me about a project you’re hiring for, get in touch. Alternately, come say hi on Twitter and I’ll see you back here tomorrow. 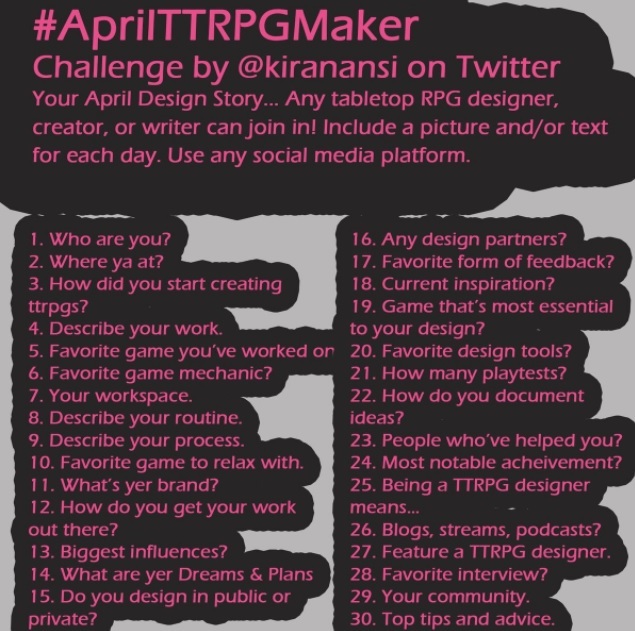 Next April TTRPG Challenge Day 11: What’s Yer Brand?